In the spirit of change, we decided to become vegetarian. No red meat, no poultry but maybe seafood. This was more of a health related decision than anything else. I am not sure why we had not done this before. After all, we typically ate meat once a week (except during the holidays when, I admit, it gets a little out of control) and whenever we dined out. Do I think we will miss meat? Do I think it will be a difficult change? On the contrary, I accept this as a interesting culinary challenge. Another reason to be creative in the kitchen. After the first two weeks as an official vegetarian, it became obvious that, just as was suspected, this was not going to be very difficult. First, we were doing it together. That way, we can keep each other in check, and offer support and a gentle reminder when the other (usually me) behaves like an omnivore. Second, vegetarian options are endless and adding just a few key ingredients can turn a boring or over-done dish into an exciting new dinner staple. Like these croquettes. Croquettes are typically cylindrical or circular disks of food, breaded and deep fried. While mashed potatoes and meat are typically the base, other ingredients can be substituted. And while deep frying is rarely undertaken in my home, I have found that the same crunchiness is achieved by searing in a little oil on high heat. Here, green peas are the base and soft goat cheese adds a striking flavor and contrast to the crunchy exterior. 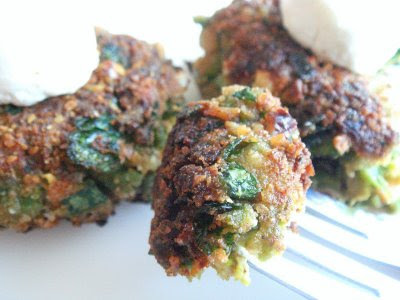 If you like crab cakes, I think you will like these little green patties. This recipes makes four to five large cakes or about eight appetizer-sized ones. 1. Bring frozen peas to a boil in two cups of water for three minutes, drain and set aside. 2. Add one tablespoon vegetable oil to skillet over medium heat. Saute onion and garlic until soft, about three minutes, and add peas. Cook for another two minutes. Remove from heat, cool slightly, then puree in food processor or blender. Set aside. 3. In a large mixing bowl whisk together ricotta, chevre, egg, paprika, cayenne pepper, and salt. Combine well. Add pureed pea and onion mixture, parsley, and half of the breadcrumbs. 4. Set skillet over medium high heat and add about a quarter cup of vegetable oil. While oil heats, form pea mixture into 1 inch thick disks. Coat each side with reserved bread crumbs. Once oil has heated, add two or three patties at a time and cook for three minutes on each side. Remove to paper towels to absorb excess oil. Serve with a wedge of chevre. I'm not really a green pea fan but this is something else entirely! And I love how it has the look of deep-fried but achieved much more healthily. I noticed, too, that the food we ate at home tends to be 60-70% red-meatless (lots of beans and fish/shrimps); as a child, I disliked vegetables. Thank goodness that reason came with maturity! I agree, being a vegetarian has made me think about certain ingredients in entirely new ways. seems delicious... No need to eat meat after this wonderful recipe. (just kidding, I think I'm not that brave, I love meat but not as much as vegetable). I make something very similar with zucchini and serve it with yogurt. As I'm not familiar with chevre, I think I'll serve this one with yogurt too. Thanks Jessie and Zerrin. Yes, I think yogurt will be fine here. We used this recipe as a starting point for dinner this weekend. We were out of peas, so we actually pureed steamed haricort verts in the food processor and used them instead. Also, I substituted the ricotta for finely crumbled tofu. The result...delicious! Thanks for the culinary inspiration. This is great news. You sound like an excellent cook, being able to make such successful substitutions. I myself should make this recipe with beans. And the tofu makes this ubber healthy.